Looking to get info on what mounts people at using for their NP-101 in ALT-Az mode. The lighter the better. Thanks in advance. Is there something in particular about this scope that changes the mounting requirements, as compared with most other 10-12lb 4" refractors? Some of the popular manual alt-az mounts for this class of scope (that are currently available off the shelf) are the Stellarvue M2, DesertySkyAstro DSV 1 or 2, and the Discmounts DM4. All will pair well with the NP101, given the right tripod. There are others from Vamo and Universal Astronomics, but as far as I know they are difficult/impossible to get new. And of course your options increase if you're looking for computerized mounts, but that's not an area I'm familiar with. I'm sure I missed a few, but those are some good options. I personally use an SV M2, which I'm very happy with. As far as price the Orion VersaGo II is much cheaper than the Vixen Porta II. The other reason I like the VersaGo is because it has degree settings on the alt an az so you can use it to manually find objects if you use app that gives the real-time alt-az coordinates. I've used a DM-4 and Tak Modfied Teegul with excellent results. Of the two the DM-4 is lighter. The Tak has slo-mo controls, though. I used to use the Porta II, but found it to be not quite there because of vibration when using higher power. The NP101 is now usually on a Gibraltar mount and wood tripod, and can be carried out to the driveway in one trip without a whole lot of effort. It also does very nicely, maybe a bit better, on my DM-4 with Series 4 Gitzo tripod. That setup is lighter, but harder to carry in one trip because it's not quite as well balanced for carrying purposes. I use my Tele Vue TV-101 on a Tele Vue Gibraltar and a Losmandy AZ8. I prefer the Gibraltar as once balanced it is just so smooth. I simply mount the clamshell directly on the TelePod using the two 1/4" studs and knobs. I did buy the AZ8 so that I could leave the Losmandy 7" dove plate screwed to the clamshell. 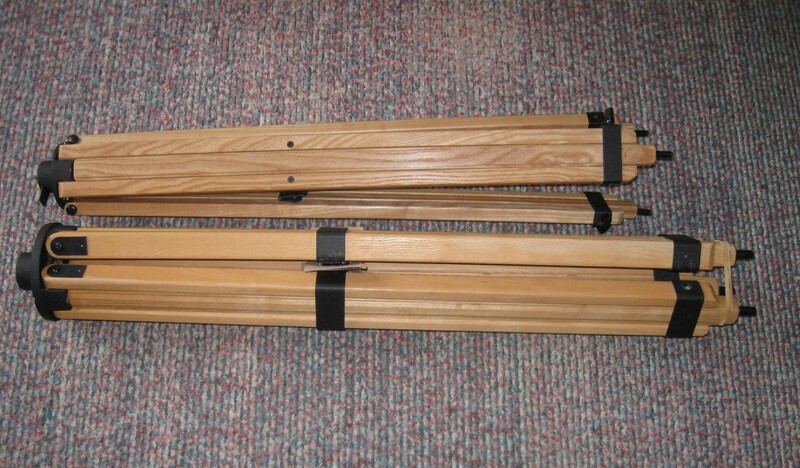 This would allow me to use both on my Losmandy AZ8 and GM8 when desired. 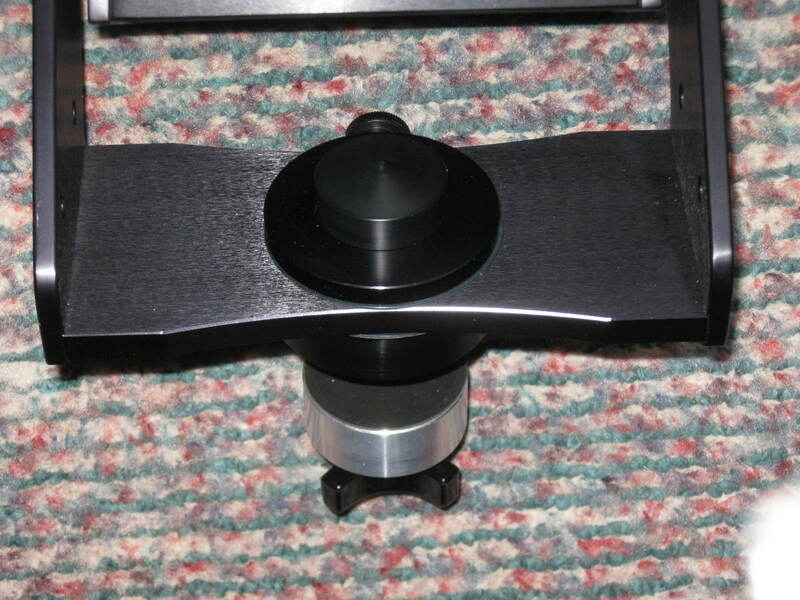 I did buy the Tele Vue AVT-1011 Vixen dove adapter but it has one bevelled and one flat edge and this is a problem with the AZ8 as the saddles are mounted sideways and the grip on the flat surface on the adapter is simply not enough. This adapter is designed to allow swapping from TelePod head to Vixen saddle without changing dove plates. Vixen is not quite the same as Losmandy but I don't know if anything else is available. DiscMounts DM-4 if money is no object. Otherwise the Stellarvue M2C will get you 90+ percent there at 25 percent the cost. 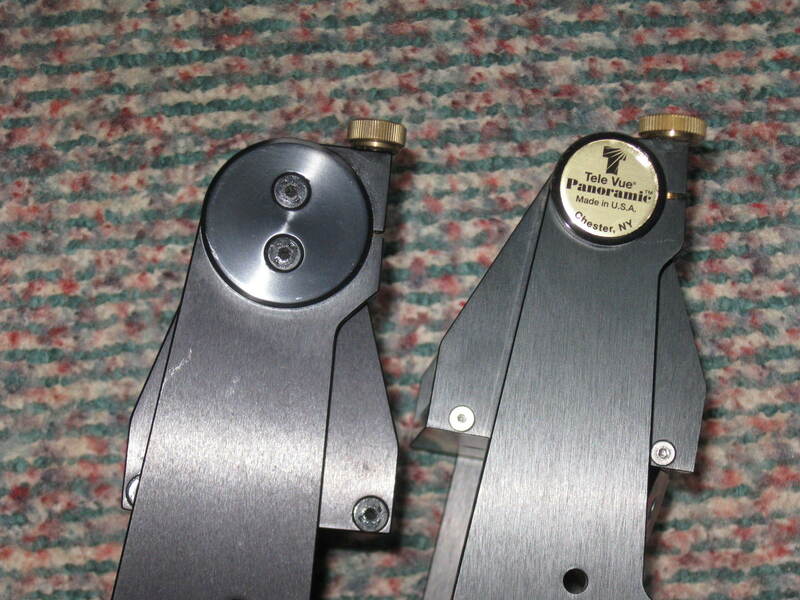 I have and use both regularly with refractors up through and including my SV-115T. Edited by NC Startrekker, 10 February 2019 - 04:26 PM. Stellarvue M2C or M2 (alt-az head) preferably with SV support column. Pick your choice of supporting tripod. Edited by vkhastro1, 10 February 2019 - 04:47 PM. 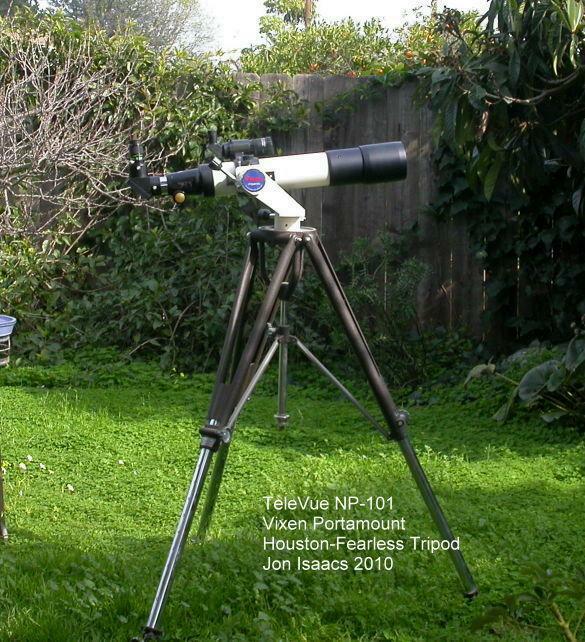 I sometimes use my Portamount with the NP-101 with a more robust tripod. But the main mount is the StellarVue MG-2, It appears to be a variant of the Sky-Tee mount but single sided. I much prefer alt-az refractor mounts with slow motion controls for tracking at higher magnifications. Refractors are short little guys so there isn't the mechanical lever a Dob has to slow down the motion. Gibraltar is my first choice. Perhaps a Vixen APZ as second. Altair Sabre third. I second the Gibraltar! It's a wonderful combination!! The Stelarvue M2 kit with the column and the CGEM steel tripod would be rock solid for such a small 4" refractor. Given it’s wide flat field, I would assume most of your viewing to be at med to low mag, which is perfect with that mount. I got the optional handle with mine but I often ends up turning the ota without it, mostly because that handle is a bit too short for my 5" refractor. Manually tracking without fine controls becomes a bit tricky and tedious at 200x, even with 82 degrees eyepieces but it can be done. Edited by AxelB, 11 February 2019 - 12:44 PM. These scopes are definitely worthwhile at 200x, I go to 308x on close doubles. 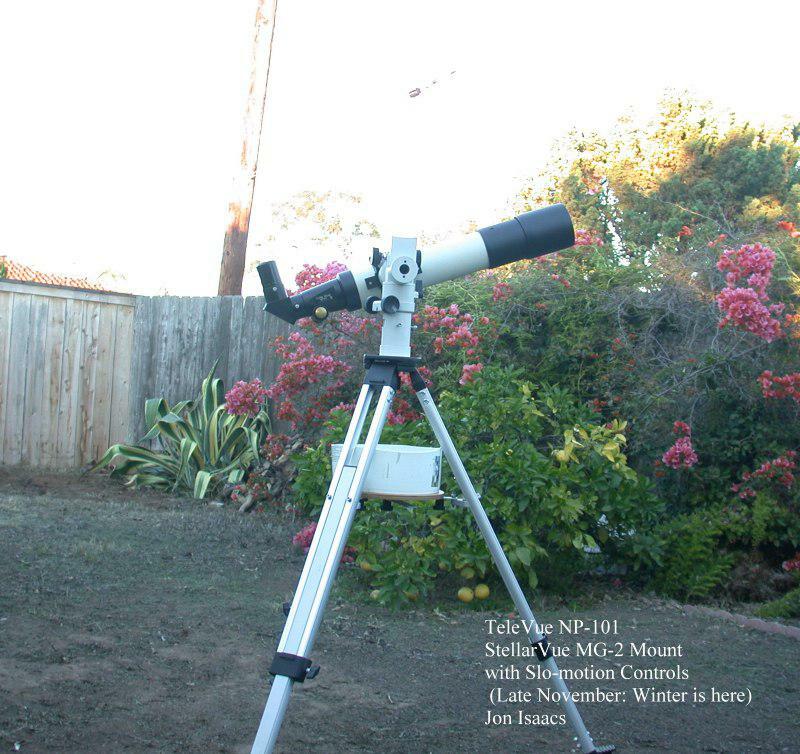 In my opinion, an NP-101 deserves a mount that's solid and easy to track at such magnifications. Otherwise, the mount is getting in the way of the scope and what it can do. Here, I seeing a lot of support for the Gibraltar but that is not what I have seen in the mounts forum. Does it really allow easy, precise tracking at 200x, 300x? Is it solid so real time focusing at 300x is doable? These are my criteria, that's why I generally use the SV-MG2 rather than the Portamount. The Portamount is not that bad at 200x-300x but it definitely vibrates in a breeze and vibrates while I am focusing.. This actually worked pretty well but the tripod weighs close to 30 pounds. Not quite grab and go. Of course it's rated for 400 pounds so it would support the scope, me and my wife with some reserve. That’s funny Jon, because what I see in the Mounts Forum is to stay away from the Porta II with anything greater than 10 pounds. I have a Porta II and I like it very much. It handles my featherweight Fujinon 102mm F6.4 with ease, but that OTA is short and slight. When I had my heavier Stellarvue 102mm F7 apo I used it some on the Porta (see my current avitar) and it was visibly getting to the mount’s weight limit. My TV Genesis SDF is considerably heavier and I wouldn’t even consider it on the Porta. My Gibralter on the other hand does fine with the TVGSDF. I have never gone above 216X with it (using my 2.5mm Vixen LV), and more frequently the upper limit of 180X (3mm TV delite) because of limited seeing, but the Gibralter is just fine! Edited by terraclarke, 11 February 2019 - 03:50 PM. I completely agree with you Terra! That's why I sold my Losmandy GM8 and went BACK to the Gibraltar. I kept track of the times I needed the tracking v/s setup time for the GM8 and realized it just wasn't worth it. I rarely go above 200X (limited seeing) and my Gibraltar is very smooth and dampens quickly. As for the Porta II, my TV102 is longer than your SDF, so no way! Edited by Mike W, 11 February 2019 - 03:34 PM. Gibraltar 5 would be great for a NP101, Panoramic just copes, but I think the criticism is its ability with a NP127, a heavier OTA. I have seen Gibr 5s on Panoramic wooden tripods, a bit teetery, but the bigger tripod made to take the 5 and NP127 looks much more up to the task. No doubt a Gib5 would do the job, however here's some photos of the Gib.4 next to the panoramic. The tripod is much larger and heavier, the altitude bearings on the Gibraltar are massive and the azimuth bearings acts like a fluid type head, very smooth and tight. Edited by Mike W, 11 February 2019 - 03:52 PM. The two altitude bearings, Gibraltar on the left. No doubt a Gib5 would do the job, however here's some photos of the Gib. net to the panoramic. The tripod is much larger and heavier, the altitude bearings on the Gibraltar are massive and the azimuth bearings acts like a fluid type head, very smooth and tight. Yep, both tripods are made of the same wood (ash), but I would say that the tripod for my Gibralter weighs about twice what the Panoramic tripod weighs. I’ve never put them on a scale, but I would say that the comparative heft when picking each up in its bag and carrying it seems so. Speaking of fluid head panning, my Panoramic mount has the optional pan handle, but to my knowledge the handle option isn’t available for the Gibralter. Too bad, I really like it. I just love both mounts tho for smoothly sweeping up star dust! Edited by Mike W, 11 February 2019 - 04:17 PM. The M2 is sturdier than the Porta2 but if the OP plan to often manually track above 150x, the M2 is not the perfect tool for the job. I would like to know if you can find a manual alt-az mount offering fine tracking control that’s stronger than the Porta2. I was not able to find such a mount so I bought that M2 with the column and CGEM tripod. (Maybe that thread should go in the mount forum). Edited by AxelB, 11 February 2019 - 04:41 PM.